I am really excited today to share with you not only a recipe, but a product I have been loving lately. Anything that makes it easier to get dinner on the table is a plus in my book. I mean, my day job at the moment has predictable and standard hours, and yet by the time I commute, pick up my son, and get all of us in the door, it’s often at least 6 PM before I start dinner prep. Plus, even for someone who really enjoys cooking, dinner can feel like little more than a speed bump before bath, books, bedtime. So, yeah, simplicity is best. Convenience is my friend. However, I still like to make a lot of our food from scratch, and prefer to minimize heavily processed ingredients. So finding that balance is a constant quest – ingredients that are convenient and fresh are worth their weight in gold. And tasty! Tasty is NOT optional! 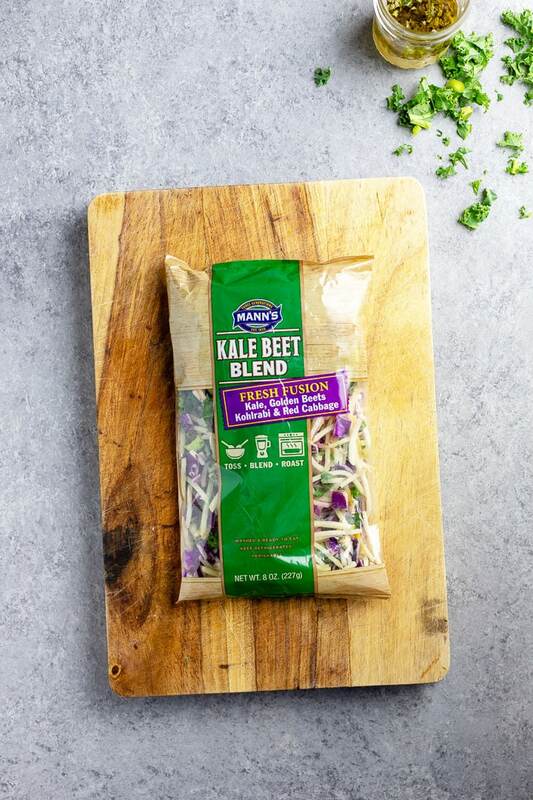 I’ve long been a fan of Mann’s “Family Favorites” veggies, because they are all pre-washed and pre-cut, so you literally can dump and toss, dump and sauté, dump and roast… you get the idea. Their Veggie Slaw Blends take all that goodness next level. 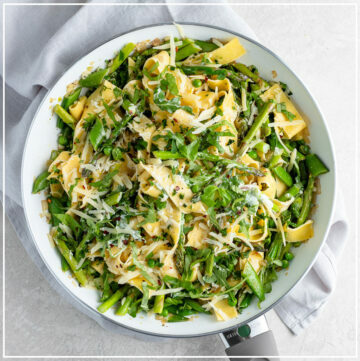 Each one is a balanced mix of fresh, pre-cut veggies, perfect for adding to a stir fry, topping a sandwich, or forming the base of a salad that’s so easy and not boring. Kale Beet Blend (kale, golden beets, kohlrabi, and red cabbage) – this is what I used in this salad! Broccoli Cole Slaw (broccoli, carrots, and red cabbage) – a perfect classic! The real beauty of these blends is their versatility. And you can never go wrong with one in the fridge to whip up a quick salad! 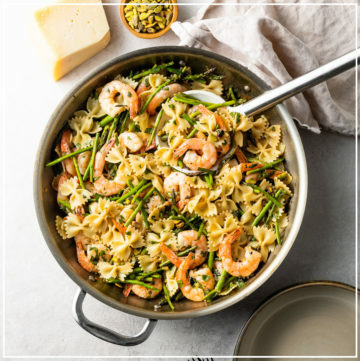 This recipe is so simple, but is meant to inspire you to create something really delicious with just a few well-chosen ingredients. 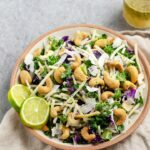 Toss the slaw blend with some crunchy cashews and coconut chips (aka coconut flakes), and then top with the most delicious, tangy cilantro-lime vinaigrette. Combine everything in a small jar, shake well, and you’re done! Chili – beef or sweet potato black bean! Boom. Options to get a dinner on the table that I feel good about, even when I have just a few minutes and barely any energy. And, let’s face it, when veggies are easy and delicious, we’re all way more likely to eat them. I definitely feel good about that! What do you think? Do you love convenience foods like this? What other types of easy recipes would you like to see? Let me know in the comments below! Please also rate the recipe and leave a comment below if you try this slaw or any other recipe on the blog. I love hearing from you, and other readers will benefit from your experience! 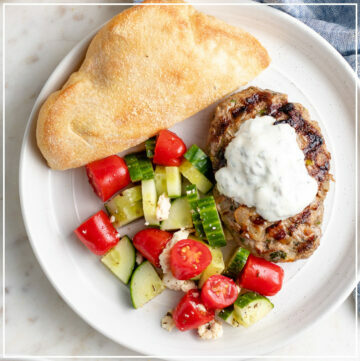 Quick, easy side dishes can also be exciting! 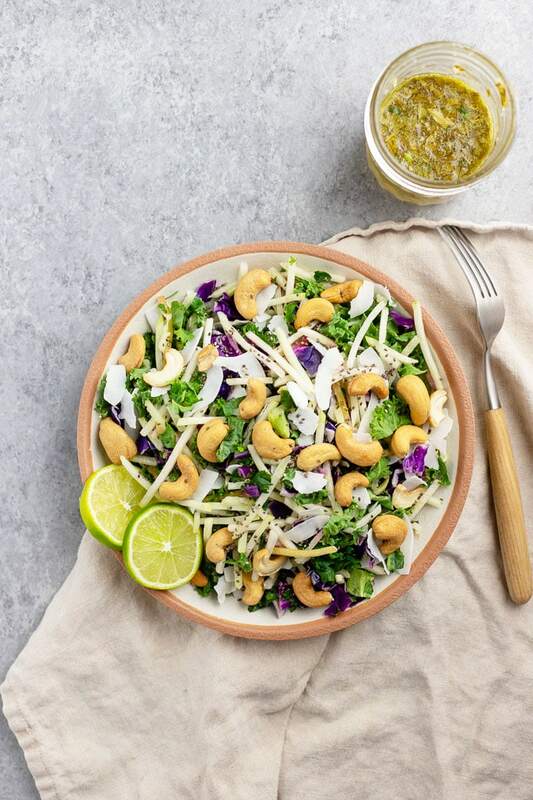 This cashew coconut slaw with a tangy cilantro-lime vinaigrette is all of the above. Fancy AND fast, and it has a great crunch that goes perfectly with chili, grilled chicken, or fish! Dressing. Combine all ingredients in a small jar and shake well. You can do this ahead and store in the fridge for up to a week. Slaw. Put slaw in a large bowl, drizzle with dressing, and toss to combine. Add cashews and coconut chips, and toss again, gently. Garnish if desired and serve right away! Did you make this recipe?Leave a review below, then snap a quick picture and tag @nourishandfete on Instagram so I can see it! This slaw looks so fresh and light. Loving the flavours you have put together in here. Can’t wait to try this for lunch soon! What a fresh looking slaw! 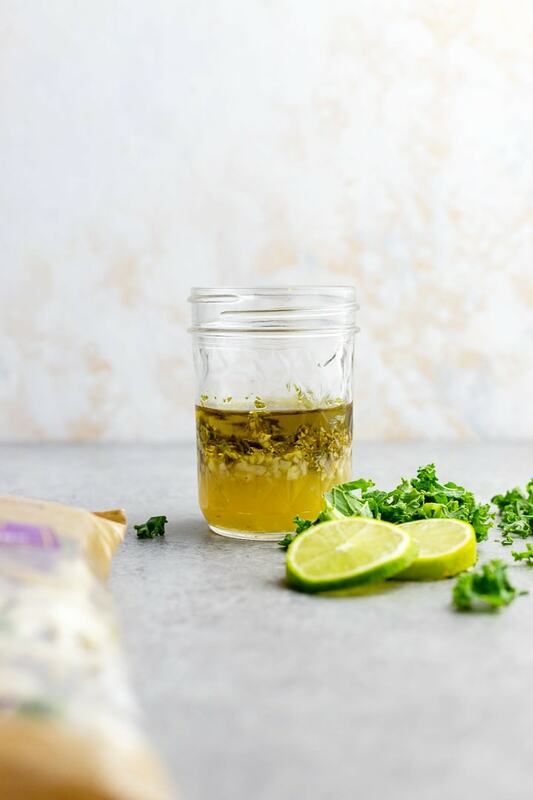 I love the ingredients – cashews, kale and the cilantro-lime vinaigrette. Perfect side! Oh, this looks so fresh and crunchy! 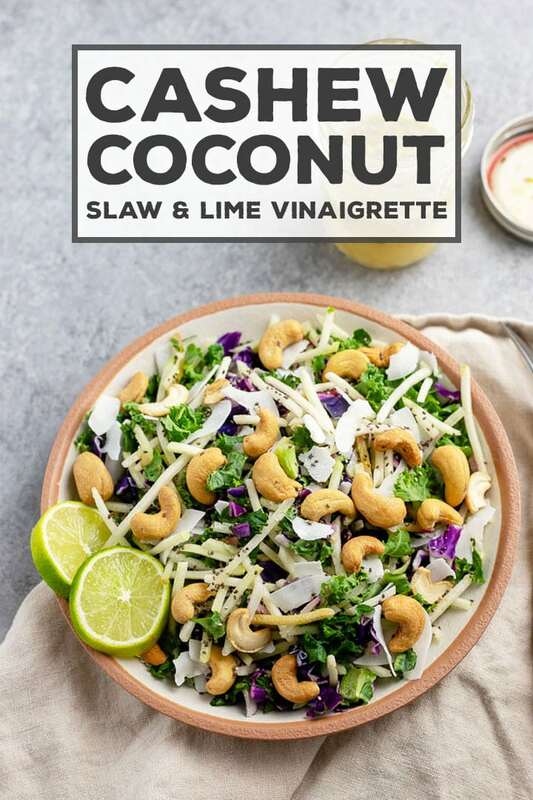 I love the addition of cashews and coconut flakes, such a nice change from your average slaw! So much flavor in this slaw! I can’t wait to make this in spring and summer with all the holidays. I bet this would be tasty with pulled pork or severed as a salad. I love the coconut added to this slaw!! Such a fresh idea and perfect for summer too!! I will be making this slaw many times!! This is my kind of lunch — love the crunchy veg — and I happen to have a whole can of cashews in the pantry right now! Great timing! This looks absolutely incredible! I love my salads, and this one is a must try! Thank you for sharing! I love all the ingredients that you have combined into this slaw. Who knew cashew, coconut, and kale would taste so good together. Look at the beautiful vibrant colours of this dish! I just love when food looks pretty, and when it’s also incredibly easy it’s just like winning the lottery! 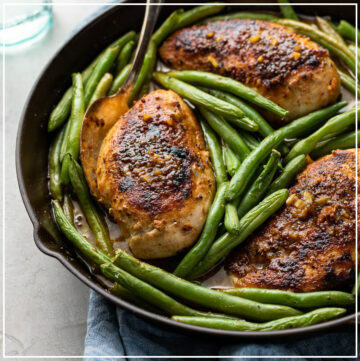 Fantastic recipe, thank you for sharing! 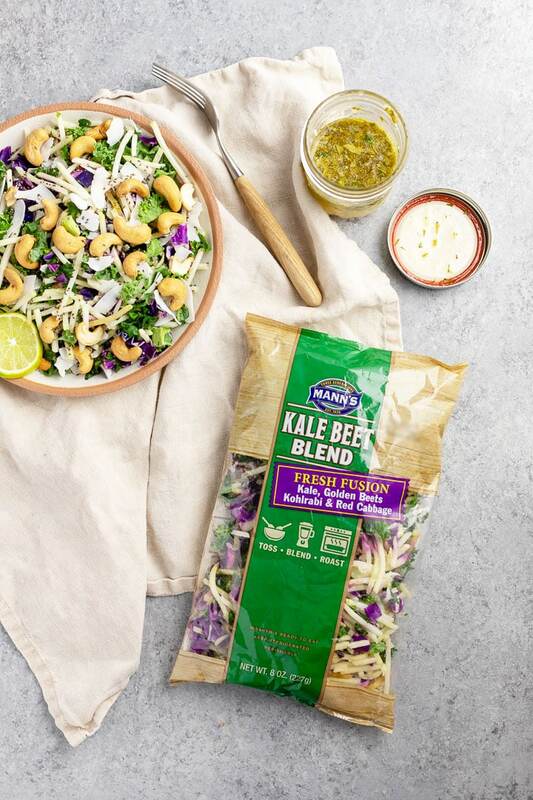 Cashews, kale and slaw? With a homemade cilantro lime dressing? What an incredible combination! I’ll be eating this tomorrow for lunch, thanks! Hi, I’m Monica! 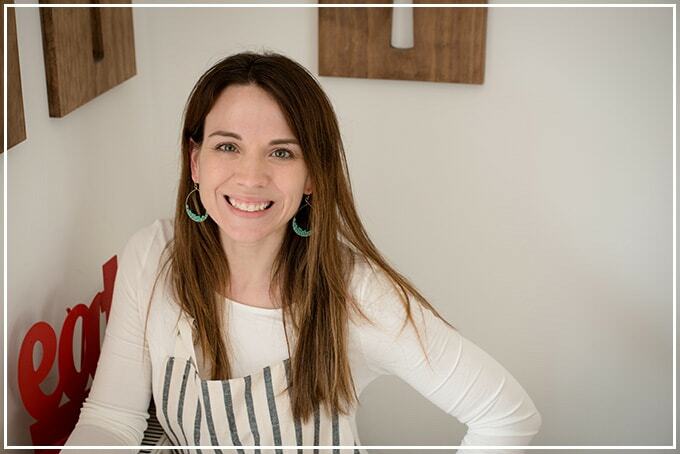 I’m a working Mom who loves sharing recipes for busy people who still want to cook, mostly from scratch. Follow me to make meal time better!